Chicago native, Alvino began playing drums at the age of 10 with the William Penn Elementary School drum and bugle corps. Soon after, he was keeping rhythm for various local bands, and by the age of 14 Bennett began traveling the country, working the club circuit. At 17, he was spotted, approached and asked to play with blues legend KoKo Taylor. Around the same time, Bennett had opportunities to play with many other blues and R&B luminaries like Willie Dixon, Muddy Waters, Cash McCall, and Mighty Joe Young, just to name a few. In 1974, Bennett was asked to tour with the late great songstress, Minnie Riperton. Touring with Riperton opened the doors for many other projects, including working with Gong Show Guest, Jaye P. Morgan and Motown’s best kept secret, The Originals. In addition, Alvino also worked with the The Sylvers and recorded with other leading Motown artists. Bennett hit on one of the biggest projects of his career in 1978 when he joined the million-unit selling R&B band, “L.T.D.”. Bennett's awesome reputation spread and he became a highly sought after drummer. Alvino has played with music legends like Cheryl Lynn, Chaka Khan, Stevie Wonder, Kenny Loggins, Bryan Ferry, Robin Trower, Sheena Easton, Slash’s Blues Ball, Patrice Rushen, Little Richard, Bo Diddley... and many more. When not on tour, Bennett writes and produces his own music and also works with other artists. Palm Springs native, Anthony Patler was born into a true show business family. He began playing professionally at age 6, fronting a trio with his brothers Kory (age 12) and Greg (age 13), and continuing his career by playing in several popular local bands throughout his junior high and high school years. After graduating, Patler moved to L.A. where he quickly landed his first major recording gig, collaborating with the songwriting hall of famer, Lamont Dozier. In addition to co-writing several songs, he arranged and played drums, bass, guitar and keys on various albums. During the same period he also co-founded and played with the underground funk band General Caine, recording a number of albums. In 1984, Patler began touring and recording with Chaka Khan, eventually becoming her music director (where he and Dave Mason Band drummer Alvino Bennett first played together). From this, he went on to record and tour with many well known artists including: Michael Jackson, Patti Labelle, The Temptations, Smokey Robinson, Janet Jackson, George Michael, Michael McDonald, Was Not Was, ABC, Solomon Burke, Rick Astley, and Paul Young. Patler’s credits also include film soundtracks and co-writing songs for Janet Jackson, Chaka Khan & L.T.D., among others. To Patler’s delight, a recommendation by long-time friend Alvino Bennett, led to him joining the Dave Mason Band in May, 2009. South Florida native John Sambataro started playing guitar at the age of 7. Growing up in a musical family and inspired by his father, a musician and band director, made his career path an easy one to follow - and it began around age 16. Sambataro's musical talents are many. He plays guitar, bass, and mandolin. He’s a proficient MIDI sequencer and solid vocalist. He’s also a song and jingle writer, producer, and engineer. In the mid-70s, Sambataro began working at Criteria Recording Studios in Miami. There he was able to meet producers who used local musicians to create parts for their artists. Sambataro was fortunate to perform and record with: Andy Gibb, Barry Gibb, Stephen Stills, Eric Clapton, Peter Frampton, Terri DeSario, Meat Loaf, John Parr, David Coverdale/Jimmy Page and many others. His experience at Criteria gave him the opportunity to record and tour with an impressive list of musicians, including: Dave Mason, McGuinn, Clark & Hillman (The Byrds), Firefall (as their new lead singer/guitarist) and Dion (Dion & The Belmonts). Sambataro took his first touring leg with Mason in the summer of 1978 while still joining other various touring opportunities with McGuinn, Clark and Hillman, Firefall, and Dion. In 2001 the Mason band circled back to Florida, and Mason asked Sambataro to sit in on his DVD “Live At Sunrise”, recorded at Sunrise Musical Theater. Sambataro admits that one of the most awesome things about playing with Dave on stage and in the studio is that ever since he was a teenager he has always been a fan and still is. When he's not on the road, Sambataro lives in South Florida with his wife Cathe and has two sons Jason and Jarrad who are also musicians. Check out his solo album Me, Myself, and I.
Gretchen Rhodes has long been a fan favorite – and it’s easy to see why. Rhodes’ unique, soulful blend of blues and rock always gets audiences on their feet, singing, dancing and joining in the fun. While trained in the classical tradition, Rhodes has found her passion fronting rock and blues bands. 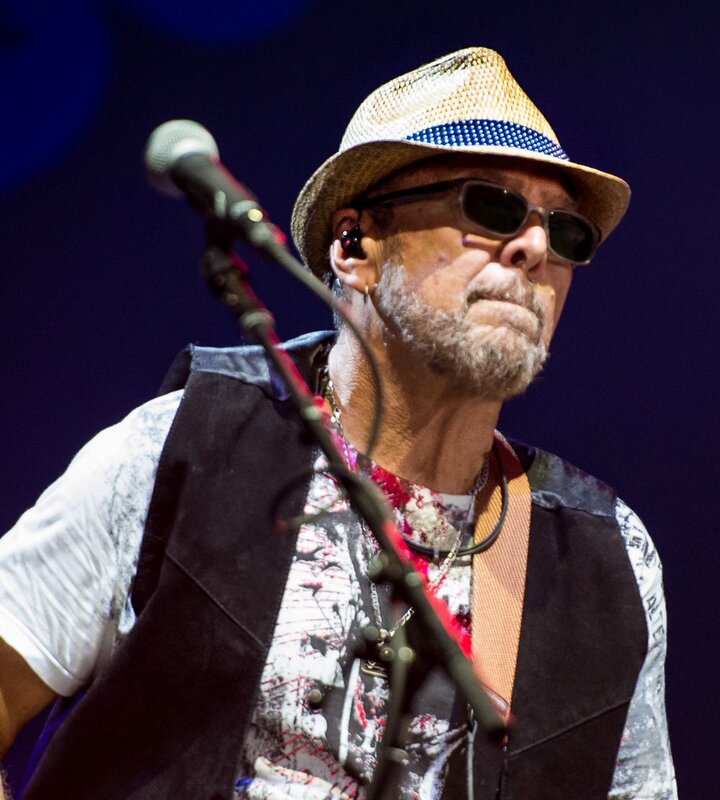 Rhodes has collaborated on stage with an impressive list of music industry heavies, including funk genius George Clinton, rock icon Steven Tyler and Doobie Brother Pat Simmons, as well as recording, performance, and music video appearances with Kenny Chesney in his ‘Life on a Rock’ album and ‘Wild Child’ music video. Always looking for directions to grow musically, Gretchen has a side electronica project with the Embassy of Joy. Embassy of Joy produced the track “Addiction” (a remake of Jane’s Addiction’s “Jane Says”) which was the #1 Deep House track in the world for three months. Gretchen is the newest member of the Dave Mason Band. When not touring, Rhodes fronts Mick Fleetwood’s Band with the legendary Fleetwood Mac drummer. We are so delighted to welcome her dynamic talent and Aloha spirit with us. Check out Gretchen on social media. Southern California native Chris Curtis has a long history in musical production. Chris became interested in music as a preteen; he learned to play drums and started touring with bands as soon as he could drive. Curtis’ talent for mixing sound led him to become a sound engineer in the late 1980′s. He founded his own recording studio, Pacific Coast Recording, in 1990 in Long Beach, California. His client list included Eddie Money, War, Edgar Winter, Snoop Dogg, Keith Emerson, and Jenni & Lupe Rivera (where he earned gold and platinum recognition for his work). His audio engineering talents also crossed into the multimedia world where he recorded and edited audio for movies and commercials that included the talents of Carol Burnett, Barbara Eden and Gary Sandy while working with companies like Burger King, Disney, Carl’s Jr., Mendelsohn/Zien, Yamaha, Marvel films and most Los Angeles radio stations. After 14 successful years at his recording studio, Curtis decided to return to live sound engineering. Introduced to Dave by long time friend and keyboardist Bill Mason, Curtis has been with the Mason team since 2003. When not on tour, Curtis continues to produce and engineer in his studio and enjoys sharpening his knowledge of U.S. history just for fun. Arkansas native David Grubb comes from a musical family. His interest in playing music started at the age of 14, inspired by Stevie Ray Vaughn’s amazing guitar work. He started studying music, playing guitar and drums. Later, Grubb formed a band with three of his friends that is impressively still together today - more than 15 years later. Grubb’s career in the transportation and music industry has taken him all over North America. He started in the transportation business at the age of 18 and has worked in many aspects of transportation from DOT regulations, route scheduling, customer relations and overseeing safety operations for some of the nation’s largest transport companies. At age 32, he began operating his own trucking company and was a contractor for the FedEx Corporation for 10 years. After many years of looking to further his career in the music industry, he sold his trucking company and moved to Nashville. Now, you’ll find Grubb behind the wheel of the tour bus or behind the merch table. When asked what it’s like traveling the country with the Dave Mason Band, Grubb replies, “It’s like being on a working vacation with your family. Everyone makes sure everyone is taken care of." New York City native, Rick Kelly has spent decades in tour management. The Dave Mason Band knows they are safe and cared for in Rick’s capable hands. He’s known as ‘the Oracle’ because he seems to know everything about everything, or at least knows how to find the answers. While Rick was growing up, his mother worked for Robert Mellin Inc., a major publishing company in the heyday of “Tin Pan Alley” located in the 1650 Broadway building - the same building that was home to the Famous Allegro studios. Rick was instantly fascinated with music and the recording industry, and witnessed up and coming music execs like Doug Morris and Bert Berns. At 16 he snuck into the Fillmore East and saw his first live show. Kelly was instantly taken by the energy of the performers and the workers and he went back many times; getting to see shows like the Allman Brothers, Delaney & Bonnie with Eric Clapton, Jack Bruce & Friends and Leslie West’s Mountain to name a few. Kelly moved to Los Angeles and befriended musicians who played in various garage bands. He become engrossed in guitar and began playing; he also started helping friends with their bands by moving equipment, doing sound, and repairing guitars. The consummate roadie was born! Rick has worked with more than 50 bands over the course of 42 years including Foreigner, REO Speedwagon, Black Sabbath, Sammy Hagar and Van Halen. Of all the bands he has worked with, there were only three that he listened to as being a fan of prior to to being in the business… the longest being Dave Mason who he had been a fan of since 1967. Kelly was honored when Dave asked him to join a team that had its origins steeped in the beginning of the rock music revolution… and the feeling is mutual. The Dave Mason Band feels very lucky to have Rick. Winifred Wilson is Dave Mason Band’s hostess with the mostest. Winifred thinks one of the best parts about touring is being with all the people who show up. Wilson is hard at work behind the scene with Dave and the team - ensuring each and every show is amazing… but you’ll also see her out front at all our shows, greeting friends and fans and working at the merchandise booth. Winifred blogs about experiencing yoga in everyday life on the road on her website www.winifredwilson.com. When she’s not on tour or teaching she’s writing a book called Downdog for Roaddogs and wondering if she will have the guts to publish it.